Berlin, Mira. "Rebecca Belmore". The Canadian Encyclopedia, 30 March 2017, Historica Canada. https://www.thecanadianencyclopedia.ca/en/article/rebecca-belmore. Accessed 24 April 2019. ​Increasingly recognized as one of the most important artists of her generation, Rebecca Belmore's performances, videos, sculptures, and photographs starkly confront the ongoing history of oppression of Indigenous peoples in Canada. Rebecca Belmore, visual artist (born 22 March 1960 in Upsala, Ontario). In 2004, Belmore was made a member of the Royal Canadian Academy of Arts and received the prestigious VIVA Award. She was Canada’s official representative at the 2005 Venice Biennale; that year she was also awarded an honorary doctorate from the Ontario College of Art and Design (now the Ontario College of Art and Design University). Winner of the 2013 Governor General’s Award in Visual and Media Arts and the 2016 Gershon Iskowitz Prize, Rebecca Belmore is one of Canada’s most prominent contemporary artists. Rebecca Belmore was raised in a large Anishinabe family in Upsala, Ontario. She left her small hometown to attend high school in neighbouring Thunder Bay. During the summer, Belmore migrated northwest to spend time with her maternal grandmother — who maintained a traditional lifestyle of trapping and fishing and spoke only her native Ojibwa — in the Anishinabe district of Sioux Lookout. Ostracized as an Indigenous woman in a largely white high school, Belmore dropped out in her midteens to work a number of odd jobs before deciding to complete her secondary education. Upon returning for her final year, she befriended the high school art teacher who encouraged her to submit a drawing to a local competition where she won first prize. Buoyed by the positive response, the following year Belmore enrolled at the Ontario College of Art (OCA) to pursue a degree in Experimental Arts; she remained in the program from 1984 to 1987. While at OCA, Belmore began to develop her first performance-based alter ego, a character she called “High-Tech Teepee Trauma Mama.” Unlike her affable real-life demeanour, Trauma Mama was Belmore as outrageous party-girl, ribald and tactless, deliberately rattling her audiences in a mocking display of Indigenous stereotypes. Trauma Mama toured various venues around Canada; in each location the show was altered to address specific socio-political issues. In Twelve Angry Crinolines, the most widely acclaimed of these performances, which the artist staged to commemorate (and satirize) the Duke and Duchess of York’s visit to the Thunder Bay in 1987, Belmore designed and modelled a ball gown in the style of a Victorian crinoline dress, a pastiche of Indigenous stereotypes that highlighted the absurdity of Canada’s continuing relationship to the Crown. Rising to the Occasion (as the costume came be called) was later exhibited as a stand-alone piece in Belmore’s 2008 midcareer retrospective at the Vancouver Art Gallery. In the following year, 1988, Belmore was launched into the national arts consciousness with her performance, Artifact 671B, where she sat immobile in frigid temperatures outside of the Thunder Bay Art Gallery. The piece was created as a response to an exhibition organized by the Glenbow Museum and sponsored by Shell Canada in conjunction with the 1988 Olympic Winter Games, in which more than 500 historical Indigenous artifacts were put on display. The performance drew attention to the hypocrisy of a supposedly celebratory show wherein a 50-year dispute with the Canadian government over Indigenous land exploitation by Shell Canada was discreetly overlooked. In 2000, Belmore joined the Pari Nadimi Gallery in Toronto, her first commercial gallery. With Nadimi, Belmore produced some of her best-known works, such as Wild (2001), The Great Water (2002), Vigil (2002), White Thread (2003), and Fountain (2005). In 2001 she relocated to Vancouver, where she lived for over a decade. In 2002, Belmore had her sixth solo exhibition, The Named and the Unnamed, at the University of British Columbia's Belkin Art Gallery. Due to the show’s success, the following year it toured to Toronto’s Art Gallery of Ontario, in 2004, to the Kamloops Art Gallery, British Columbia and the Confederation Art Centre, Charlottetown, Prince Edward Island, and in 2006 to the McMaster Museum of Art, McMaster University, Hamilton. The exhibit featured a number of mixed-media pieces. The best known, Vigil (2002), consisted of a single-channel video installation based on a performance of the same year on a street corner in Vancouver’s Downtown Eastside. 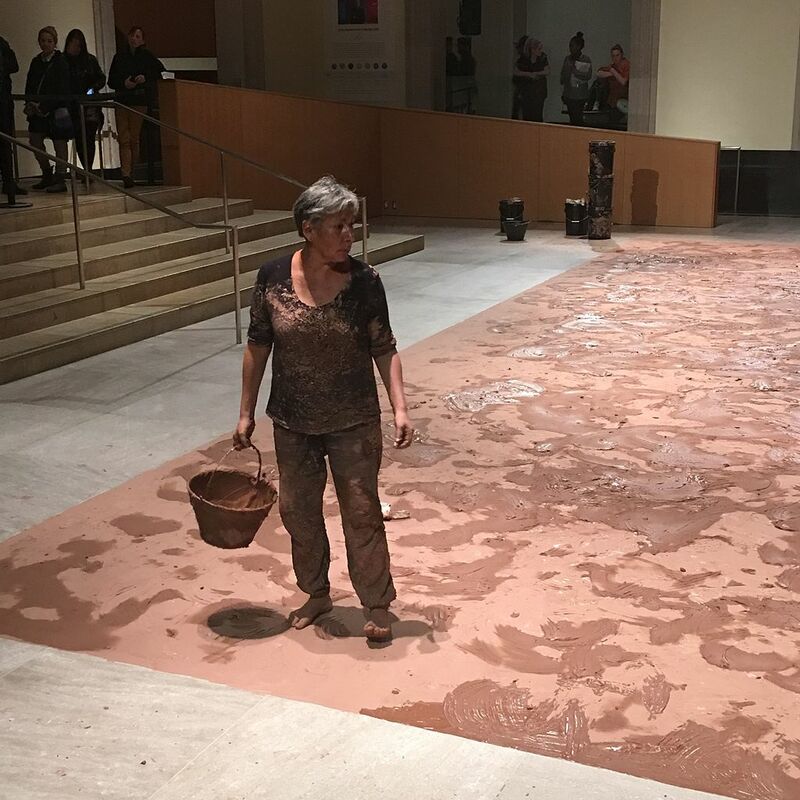 In it, Belmore is shown scouring the raw pavement on her hands and knees, her bare arms covered with the names of missing Indigenous women, which she periodically calls out as she scrubs. The piece was created as a commemoration to the hundreds of women who had gone missing in that area over the course of 25 years. In 2005, Belmore was chosen as the first Indigenous woman to represent Canada at the Venice Biennale. The piece she produced for the show — a two-and-a-half-minute video loop back-projected on a curtain of flowing water in the darkened room of the Canada pavilion — took her over a year and half to complete. The video depicts the artist frantically filling buckets of water from the Strait of Georgia and throwing its contents, which, as it splashes, transforms into blood, at the screen. In 2006, Belmore tried to sever ties with the Pari Nadimi Gallery, requesting compensation for works sold and the return of the remainder of her collection. In turn, Nadimi claimed breach of contract and launched a series of legal proceedings against Belmore, suing her for $750,000. Three years later, Belmore staged her performance Worth, in which she sat cross-legged outside of the Vancouver Art Gallery holding a sign reading “I Am Worth More Than One Million Dollars To My People”; the piece ended her public withdrawal from art-making. Belmore later established a legal fund to help pay for the litigation. In 2008, Belmore was given a midcareer retrospective, Rebecca Belmore: Rising to the Occasion, the most expansive showcase of her work to date at the Vancouver Art Gallery. In 2013, Belmore received her second residency at La Galerie du Nouvel-Ontario, which is located in downtown Sudbury. During her stay, she produced the video Private Perimeter, which opened at the gallery in May 2013. Later that year, Belmore was granted the Governor General’s Award in Visual and Media Arts. Upon receiving the award, she was asked to produce a work, which became Treaty Number Three. Filmed by videographer Danielle Sturk, the video documents Belmore pasting a dress made from paper to a young Indigenous woman with words from a treaty negotiation between the Canadian government and the Mawe-do-pe-nais (representative of the Ojibwa) in 1873 (see Treaty 3). Also in 2013, Belmore began working on a major commission for the Canadian Museum of Human Rights in Winnipeg. For this piece, titled Trace, she created a massive (30 feet high and 20 feet wide) blanket out of more than 10,000 hand-molded clay beads which can be added to by the public. It was part of the inaugural exhibition of the Canadian Museum of Human Rights when it opened to the public in September 2014. In 2016, Belmore was the recipient of the Gershon Iskowitz Prize, which includes a $50,000 cash prize and a solo exhibition at the Art Gallery of Ontario. Rebecca BelmoreSee a brief profile and selected articles relating to award-winning Aboriginal artist Rebecca Belmore from the website for Canadian Art magazine. Rebecca BelmoreThe website for multi-disciplinary Anishinabe artist Rebecca Belmore. View images and videos of installations and performances. Click on images for a magnified view. Also see the curatorial essay on the major themes and visions expressed in her art.